I RESOLVE . . . The Unshakable Lifehttp://Theunshakablelife.wordpress.comLiving daily with a debilitating disease Parkinson's. Learning to deal with the struggle. But we will not be knocked down. We will not be shakened. During the last week, of each year, we bring out resolutions, to live by, of the upcoming new year. We resolve to exercise, go to church more, be nicer and drop a few pounds. I know we have the best of intentions looking forward, so we try to do better. For most of us, we do pretty well with our resolutions say until, February. But do we also take time to reflect on the past year of what has taken place in our lives? I believe there are four areas of retrospection in which we look back to see what has taken place: the positive events, the negative events, the missed opportunities and the do-overs. The positive and negative aspects are a given. It’s easy to see what was good and what was bad. But sometimes it’s a little more difficult to see what was missed. This leads me to the fourth category of looking back; The do-over. • Fear – being afraid to make a decision. • Bitterness – anger because of results. • Apathy – non care because of rejection. • Inferiority – lack of confidence due to rejection. Let us resolve in 2016 to live a life with no regrets. Let us love like Jesus. Let us think about the words we use. Let us be givers and not takers. Happy New Year! Throughout history, tales have been told of Scottish Highlanders, faced against incredible odds, who have overcome their enemies with the help of their trusted “two-handed sword.” This was achieved because of the faith in their training, as well as the assurance of the sharpness of their sword. Notice what I said. They first had to know how to fight with their sword. And secondly, they had to keep their weapon sharp. Think about how you fight your daily battles. Yes, daily we are faced with a battle from our enemy the deceiver, Satan himself. How do you fight him? What is your weapon? Hopefully it is the Word of God. Hebrews 4:12-13 says “the Word of God is living and active. . . sharper than any double-edged sword”. We have a powerful sword to fight our enemies. Our weaknesses, to be specific. Just like the Highlander, we must know how to use our weapon. We must train daily on how to attack and how to defend our ground. But we also must keep our sword sharpened. Proverbs says “as iron sharpens iron, so must a man sharpen each other.” We must not fight the battle alone. We need other warriors to practice with to keep us sharp. Perhaps you are in the midst of a great battle, and feel you are losing ground. Pick up your sword. Pick up the Word of God. Find other warriors to enter the battle with you. Jesus promised in Matthew 18:20 that “if two or more were gathered in his name, he would be gathered with us.” That is, he will be in the fight with us. Once again remember the call from Mel Gibson in Braveheart, “FREEDOM.” Pick up you sword and march on. You can have freedom. I wrote this six Christmases ago. It still applies to today. Merry Christmas from my family to yours. Stand firm, Jody. “My wife Kim bought me a CD for my birthday this year which featured the song “I Heard The Bells On Christmas Day.” I first heard this song as a boy on an Elvis record. I thought it was a good song but never paid much attention to it. The version on my CD from Casting Crowns was beautifully arranged and I fell immediately in love with the song. But it wasn’t until I attended Christmas Eve service this year and heard the story of Henry Wadsworth Longfellow that I truly appreciated the song. One of America’s best known poets, Henry Wadsworth Longfellow (1807-1882), contributed to the wealth of carols sung each Christmas season when he composed the words to “I Heard the Bells on Christmas Day” on December 25, 1864. The poem gave birth to the carol, “I Heard the Bells on Christmas Day.” When Longfellow penned the words to his poem, America was still months away from the Confederacy surrendering to the Union on April 9, 1865; and, his poem reflected the prior years of the war’s despair, while ending with a confident hope of triumphant peace. Longfellow’s despair did not only include the Civil War. As with any writing or song that touches the heart of the hearer, “I Heard the Bells on Christmas Day” flowed from the experience of Longfellow– involving the tragic death of his wife Fanny and the crippling injury of his son Charles from war wounds. Henry married Frances Appleton on July 13, 1843, and they settled down in Cambridge, Massachusetts. They were blessed with the birth of their first child, Charles, on June 9, 1844, and eventually, the Longfellow household numbered five children. Tragedy struck both the nation and the Longfellow family in 1861. The Civil War began and Fanny Longfellow was fatally burned in an accident. Henry frantically attempted to extinguish the flames with a nearby throw rug. Failing to stop the fire with the rug, he tried to smother the flames by throwing his arms around Frances– severely burning his face, arms, and hands. Fanny Longfellow died the next morning. Too ill from his burns and grief, Henry did not attend her funeral. The first Christmas after Fanny’s death, Longfellow wrote, “How inexpressibly sad are all holidays.” A year after the incident, he wrote, “I can make no record of these days. Better leave them wrapped in silence. Perhaps someday God will give me peace.” Longfellow’s journal entry for December 25,1862 reads: “‘A merry Christmas’ say the children, but that is no more for me.” Almost a year later, Longfellow received word that his oldest son Charles, a lieutenant in the Army of the Potomac, had been severely wounded with a bullet passing under his shoulder blades and taking off one of the spinal processes. The Christmas of 1863 was silent in Longfellow’s journal. Finally, on Christmas Day of 1864, he wrote the words of the poem, “Christmas Bells.” The reelection of Abraham Lincoln or the possible end of the terrible war may have been the occasion for the poem. The year 2009 was one of the toughest years of my life. Losing a job, downsizing a house and being diagnosed with Parkinson’s disease made me at times want to say there is no peace. But God is so great and faithful. 1) did not fall in water ( that includes Luke as well ). 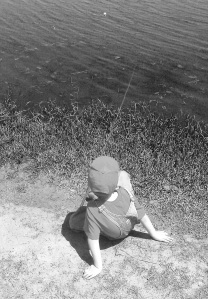 2) did not catch any fish. 3) ate chips, cookies, brownies. 4) got sunburned and muddy. I would say, SUCCESS! Actually the day was about beautiful weather, a beautiful little boy and a beautiful opportunity where three generations converged to soak in a wonderful pastime. Psalm 62:1 I wait quietly before God, for my victory comes from him. 2 He alone is my rock and my salvation, my fortress where I will never be shaken. Recently, I left all social media to spend that time seeking Gods direction in my life. you don’t realize how much time you spend on Instagram, Twitter, Facebook and LinkedIn until you stay away from it. so what I did was anytime I had the urge to fire up my iPad I went quiet or read my bible, or prayed or worshipped to wait on God. although I never heard Him say anything audibly to me, or had a vision or a dream about what He wants from me, the answer was perfectly clear in my heart. he wants all of me. yes even a broken me. especially a BROKEN ME. and that’s where I have to let him be God. a big enough God to use me in any way he seems fit. as many of you know God has created a new part of me through wood working. except for Mr. Bennett’s Industrial Arts Class at Delay Middle School I had never really worked with wood or any do it yourself projects per se. I watched my granddad forest make things out of scrap wood but that was the extent of my carpentry. but something has happened. I now can build furniture and do small wood projects. who knew? God knew! a seed for a vision was planted by God. you see when I am working with my wood, I forget about Parkinson’s. its amazing. I feel normal again. my brain produces dopamine to regain a sense of purpose. it is a shot of fresh grace from God that is as good as any high that I have ever experienced. God is so good. I don’t want to keep this all to myself. God truly has given me a burden to see people with degenerative brain diseases a chance to regain their dignity through arts and crafts and woodworking. furthermore, it is a chance to build community with folks who go into their shell and life passes by. I need help. I need my community of brothers and sisters to make Shaky Chic a place for people who can create magic in their lives again. it will take resources. Money for a building, for tools. it will take volunteers who want to see people overcome the issues that they are dealing with. lets restore and reclaim lives through this opportunity from God. you are not reading this by accident. pray what your part can be. pray that we will follow Gods direction. I started this blog over a year ago to give encouragement and tell stories of hope and of God’s grace irn difficult times. I did just that a few times and then it turned into a couple of rants on Christianity. Will you allow me to relaunch? Indulge me for a moment. As you know or may not know, I was diagnosed with Parkinson’s Disease six years ago this week. I was experiencing tremors and rigidity in my body. I was told there were Four Stages of Parkinson’s and I was in Stage One. Furthermore, I was told that the Stages would play out over time between 10 -15 years. The Stages would go from noticeable tremors in Stage One to being take care of 24/7 and most likely dementia at the end of Stage Four. I would say that I firmly in Stage Three right now. Why I am sharing this? I am a very proud and private man. Too proud I found out. Parkinson’s is a very private disease. I hate being stared at when I have tremors. I hated being told to hurry up when I was working. I hate that you notice immediately that something is different about me when you see me after for the first time in a while. I hate that my balance is so bad that I am afraid to go to functions, especially church. I hate that I only have energy in thirty minute spurts. Why am I sharing this? Because it’s not about me. In my mind, I was going to use Parkinson’s to my advantage. I would hold conferences and teach people how to live victoriously. I believed that God would miraculously heal me and I could hold crusades. The fact is that God was way too much behind the scenes and not being allowed to lead. This is about God. Parkinson’s is a tool to teach the Good News of Jesus Christ. I get the me part and not the Him part. I read the account in the bible were the apostle Paul asked God to remove an issue he was dealing with, three times. God told Paul that it was not about him. He told Paul that even though he was weak, he would be strong through the power of Jesus Christ. Paul realized that he was strickened with a problem or ailment to keep him from being proud. I get the picture. It really has taken me six long hard and costly years to come to grips with Parkinson’s. It’s not about me. So what’s is it about? It’s about living not dying. One way we live is to tell our story. To share our victories. My victories the past few years are awe inspiring when you stop and review them. There is so much more to this story. God has revealed to me a solid direction to carry out the next couple of years before I am incapable of doing so. I will conclude this lengthy blog tomorrow. Ephesians 2:8-9New Living Translation (NLT)8 God saved you by his grace when you believed. And you can’t take credit for this; it is a gift from God. 9 Salvation is not a reward for the good things we have done, so none of us can boast about it. Christianity is under attack. From the sands of the Middle East to the steps of the White House we are seeing the church face issues that we have never seen before. The media today paints a picture of the church as, right wing, homophobic , bible thumping, gun toting, exclusive, hypocritical, judgmental and conservative. This would describe Westboro baptist church and many more like it. Unfortunately, Westboro BC has taken on the face of the church for many people. This must make Jesus’s heart hurt. Jesus was about a new way. He was more about compassion and grace than legalism and rules. Don’t get me wrong, he was about pleasing his father, but did not cram rules down people’s throats. When people ask me if I’m a Christian I say yes. But I always say I am a Jesus follower. I don’t worship or follow Westboro or Bent Tree or any church for that matter. As a follower of Jesus I belong to THE church and I am THE church. The church exists for Jesus. The same Jesus who befriended prostitutes, diseased stricken, demon possessed, rival nationalities, different races, men and women, murderers, thieves and sinners. I fall into categories myself. I just want to be like him. The best clue we have as to what Jesus was doing between death and resurrection. He said, “Today—this Friday afternoon, after we’re both dead—you and I will be in paradise together.” I don’t think the thief went to hell and that hell is called paradise. I think he went to heaven and that Jesus was there with him.